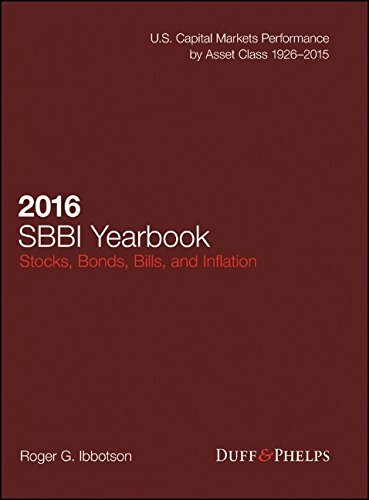 The 2016 Stocks, Bonds, Bills, and Inflation (SBBI) Yearbook is the industry standard performance data reference, with comprehensive records dating back to 1926. Covering common stocks, long-term government bonds, long-term corporate bonds, Treasury bills, and the Consumer Price Index, this book provides the essential information advisors, planners, and brokers need to analyze asset class performance. Historical return figures include the riskless rate of interest, equity risk premium, bond default premium, and the maturity premium between the return on long-term governments and Treasury bills, and total returns and index values cover large and small company stocks, long- and intermediate-term government bonds, inflation, and more. Charts and graphs allow for quick visual reference, and a clear hierarchical organization pattern facilitates efficient data location. Performance analysis is critical to successful investing, but the analysis can only be as useful as the data is accurate. Decisions made from scant information are not good investment decisions; investors need complete, top-quality data to make informed choices and properly balance risk with reward. The 2016 Stocks, Bonds, Bills, and Inflation (SBBI) Yearbook is the definitive study of historical capital market data in the United States, and the gold-standard reference industry-wide.